We are spending our winter, comfortable and happy in our new, natural home, doing small things and enjoying this season which asks so little of us. 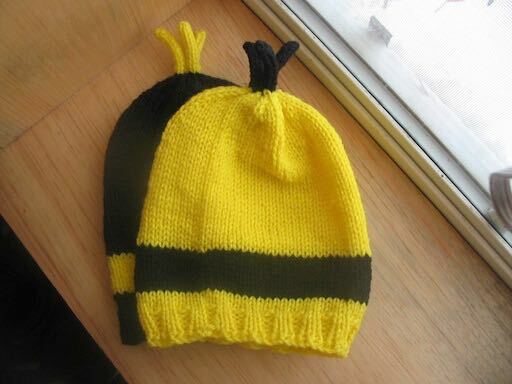 The girls have been becoming quite proficient at knitting and crochet - turning out socks, slippers, a variety of hats, sweaters, and baby outfits. We're still working mostly with store bought yarn for the learning process, but everyone is getting ready and eager to use more of the "real stuff." We have quite a bit of wool and fiber to work with, from our own icelandic sheep and angora bunnies, plus alpaca wool from Bill's sister. The younger children card the fiber for us, and I have been spinning it. I am finally getting a fairly even and fine yarn, and am working on my first project with homespun.. an alpaca fiber throw. We are all eagerly awaiting our own socks from start to finish from our own homestead. It can sure be a lot of fun when we're all sitting around working on our quiet projects. The kids have little games that they play, such as "Storekeeper," where the storekeeper tries to get the shopper to say "black," "white," "yes," or "no." Such a silly game, but it's loads of fun.. an amazing amount of creativity and humor comes out during their little scenarios. We are getting ready to start building a vertical log camp, and will be using the horses and mules to pull the logs out of the woods. Also looking forward to making maple syrup, and drinking all of the luscious, detoxing sap that we want. Bill and Andrew are continuing to work on some of the finishing in the house, as well as planning the new camp. Bill has joined the kids' bluegrass band with his bass... it's so much fun to have the house fill up with homemade music. It has been a beautiful and joyous winter! The clear days begin with a star-studded sky, followed by a rose glow on both the east and west. I always let the children sleep in, because I enjoy the quiet of the morning to myself. The last couple of days, I made a big pot of oatmeal, and enjoyed my bowl with raisins, apples, bananas, chopped walnuts, a touch of honey and fresh, thick jersey cream, cozied up in front of the fireplace, with snow flakes gently falling outside, and the kids still snuggled in their beds around me. The simple pleasures in life! 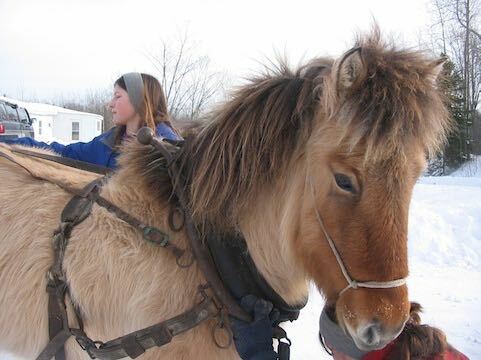 Each day, we have been spending a lot of time outside, shoveling snow and playing with the horses. One of the new mares that we got was very high strung at first, and Mary thought she would NEVER overcome that and get to riding her. Following simple practices of natural horsemanship, staying patient and calm and persistent, she has gotten SO MUCH better. 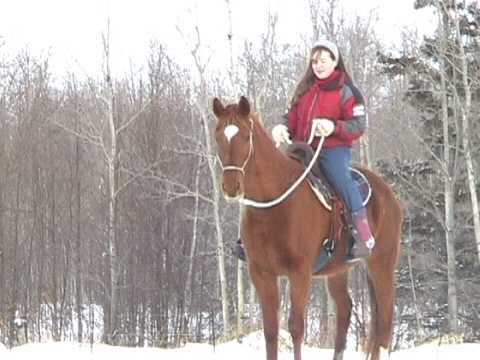 She is really a beautiful mare, with a sweet and strong spirit. It's hard not to fall in love with her. Today, Mary had an almost perfect day with her. She rode very lightly, doing all that she was asked in just a rope halter. Mary and I were both ecstatic, and felt that we had accomplished a great deal together. Now, we're starting the other mare. We've been playing games with her, saddling her up and sitting on her. She's very calm and good and eager to please. She'll make a great kids' horse very soon. We're hoping to have her trail ready within the month. I also want to work more with the mules, and their ground driving. They are really getting close to being able to pull a cart, but unfortunately, we don't have one. We also want to get them riding. The girls and I are on a huge fiber kick. We are trying to find a spinning wheel and carders, as we have a huge box of alpaca fiber that needs to be spun. Meanwhile, we're honing up our knitting and crocheting skills, and Mary has even learned how to knit socks! Andrew and Bill have been doing the electrical and plumbing in the house, and the other kids and I do the laths and plaster when they get a wall ready for us, which is rather infrequent. The rocket stove seems to be keeping the house quite warm. I took a "vitality test" for kicks this past week, and it said I will live till 95! And they didn't even ask about the healthy foods I eat, except for servings of fruit, veggies, whole grains and nuts. There were questions about how often I felt angry, sad or depressed, or stressed or anxious in the past month... "0" to all of them... as a matter of fact, "0" to all of them for as many months as I can remember since we've lived here, except for a little stress over a few external things here and there. I am deeply at peace. The rest of the family is as well, though sometimes Bill worries about money. The whole family agrees that it has been the best 1-1/2 years of our lives! 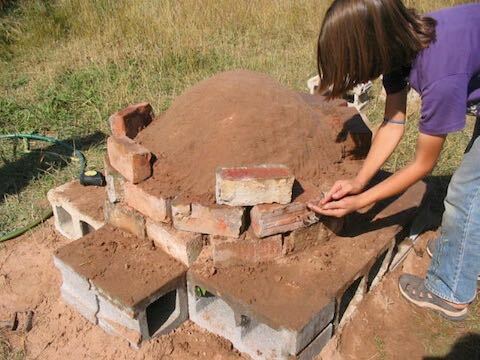 The kids and I had fun building our bread oven in a day. 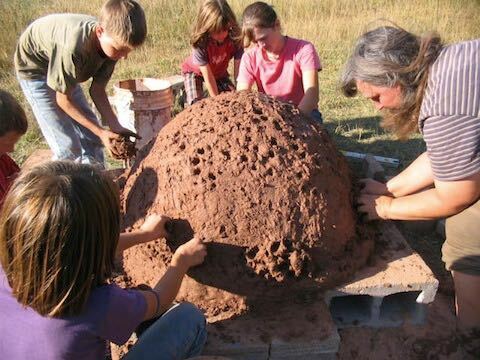 It was a little easier for us because we had all of the cob-making materials and pits on hand. I also took the easy way out and used cinder blocks for the base. That's what we had on hand, and they seem to be working just fine. The process was to first pour about 8 5-gallon buckets of sand in the area that I wanted to build the oven and level it. Then we laid the cinder blocks, leveling them as we went. Then we built up an egg-shaped mound of wet sand, again using about another 8 buckets of sand. We used bricks to help contain the sand while we built it up. 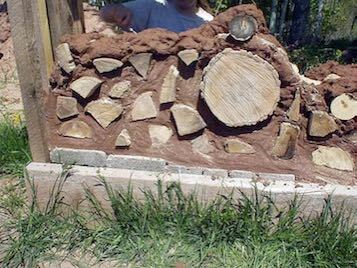 When we liked the shape and size of the sand mound, we covered it with wet newspaper. Over that, we put a layer of sand/clay cob a few inches thick, and then another layer of my regular cob mix, another 2-3 inches thick. Then we allowed that to dry for 4 or 5 days. The weather was cool and damp. Next, we cut out the door and made a fire. We cooked bread in the oven, and the next day made pizza. It was good, but a little sandy and gritty. Then we learned to mop out the ashes with a wet mop (improvised with a big rag on a stick). We have cooked in the oven several times since. We also decided to add more layers to the oven so that it would hold the heat longer. 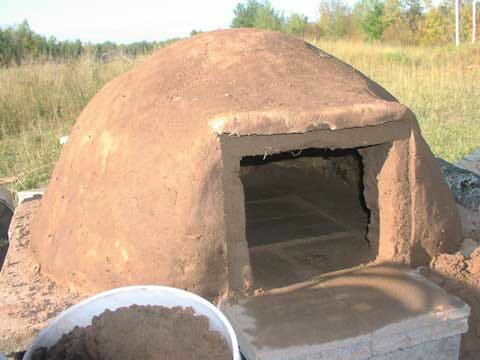 We added about 4 inches of clay/sawdust, and then covered that with another layer of plaster cob. When I've done it right, the bread and pizza have been far and away the BEST I've ever had, but I've had a few flops in figuring out the best method/temp. One thing that I've noticed is that the bread keeps much better than my regular oven baked bread. 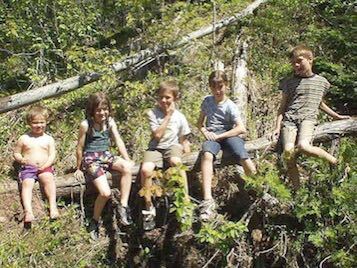 It's been over a year now, our family of 10 living cozily in an 840 sq ft 30+ yr old mobile while we build our home. So, how many of you are wondering if we snap at each other every day to "get out of the way" or "let me sit down" or "give me some space!." The answer, "Never." Quite the contrary, we get along better as a family and are closer now than we ever were. We don't have a single child acting ornery, moody or cranky. 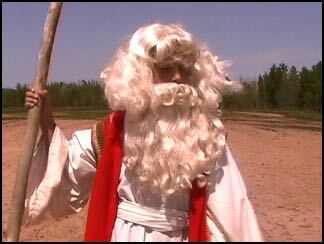 There are no outbursts of anger, and very little bickering. The unanimous vote is that we are very happy to be here together. We had 2 frosts in a row the past 2 nights. We finished the cob/cordwooding just in the nick of time. We are now looking into alternatives for the earthen floor that we planned, because it would really be pushing it to try and get that in before freezing weather. Still, there is no sense of panic here. We will stay in this mobile another winter, if we have to. We know God will provide for us, and we will be warm and snug together. The frosts have brought out the sweetness in the apples, which we have already been so enjoying. There has been a bounty of food, as generous neighbors have shared produce from their gardens, as well as that which we were able to get out of ours. We also have our butcher chickens ready for eating now, and they are so huge that they go a long way. We are enjoying chicken salad sandwiches, casseroles, and soups. We have barely bought anything from the grocery store in months. Summer weather hit all at once last week. We awoke to frost on the ground, and by afternoon it was in the 80's. The kids had to break from their work hauling sand to cool off in the creek. 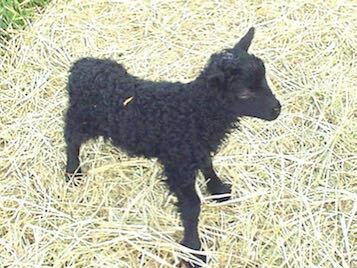 Spring births include 2 icelandic lambs, 1 ram and 1 ewe, both black at first, but the ram lamb is starting to look moorit (chocolate brown). Had my first taste of sheep milk today.. ewe . It wasn't as rich as I expected, and instead tasted almost sour with a bit of a chalkiness, or "powdered milk" flavor. My mare's milk was MUCH better.. that's good stuff, and makes fantastic kefir. Notice how quickly the icleandic lambs grow. The 5 week old ram lamb (Danny) is in front in the picture below, and the 2 day old ewe lamb (Danielle) is in the background on the left. The following picture is a close-up of her. 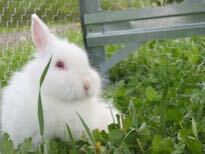 We were also given 2 French Angora bunnies, much to Theresa's delight. 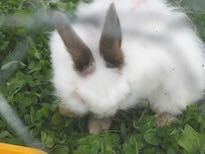 They were horribly matted, though, so we are still working on getting their coats into shape. We named them Slippers and Mittens. Slippers has soft, velvety pink ears that look like, well, slippers, and Mittens has brown paws. 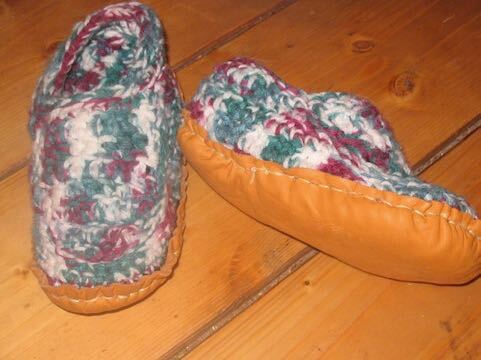 Of course, we hope to make soft, cozy slippers and mittens from their silky hair. It was quite a learning experience determining whether they were boys or girls, but, after doing the research, we're quite sure they are both girls. We put in a garden with a rustic twig fence and have just about everything popping through already. We also threw many seedballs, Fukuoka style, throughout the property. Plus, we planted raspberry bushes and strawberry plants (the plants didn't survive the shipping, so we have to replace them), built a round pen from aspen on our property for training the horses, built a rustic duck pen (still awaiting the ducks), filled our foundation with sand, built a test wall for the cob/cordwood mixture and started the timber frame on the house. 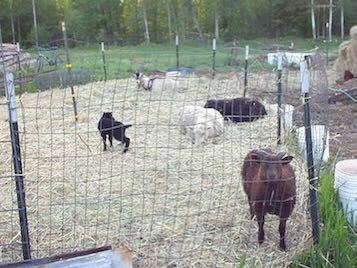 The rustic garden is on the left, and the round pen on the right. It is covered with felt that is a throwaway material from the local mill. We expect to start the cordwooding by early next week. If we work hard, we'll get it done in a couple of months. 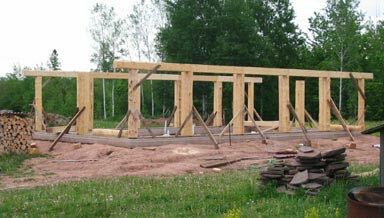 The guys will continue building the rest of the house while mom and kids do the cob mixing and cordwooding. 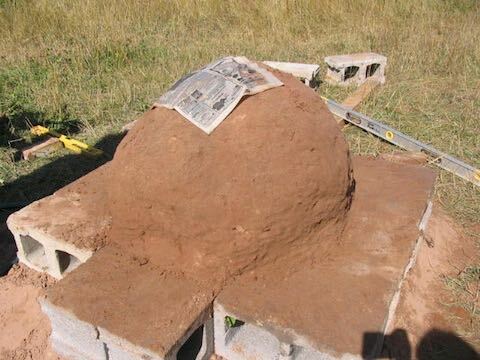 Then, we'll mix the straw-clay slip infilling for the gable ends, plus a straw-clay slip insulation layer for the earthen floor. After that gets well tamped down, we will lay the earthen floor, hoping that we get to that point before it gets too cold to dry well. We also plan to make a cob bathtub and possibly a heated cob bench, if there is time this season (unlikely). 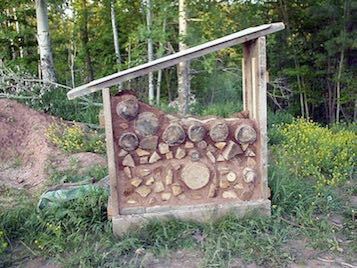 Next summer, I want to build a cob garden wall around the front yard with a cob bread oven so that we don't have to heat the house up in the summer. Yes, cob has become a fascination with me. I think I even convinced Andrew that it will be sufficiently waterproof. When my test wall was only a week old, he took a hose to it to see how it would fare. Several minutes of direct soaking didn't even phase it. Then, he put his thumb over the hose to get a direct pressure and even that took quite a while to do anything. Our mix is clay, sand, sawdust, psyllium powder, flour glue and EM's. Here is the test wall being built. The logs are just scrappy old pieces of firewood and are not evenly cut, so the "real" walls should look much better. Well, our first attempts at maple syrup making turned out to be a good learning experience, as we had hoped, plus some great syrup, sap and fermented sap. We learned that elderberry twigs will work in a pinch, but you do lose quite a bit of sap. A lot of folks cut up PVC.. that would definitely work better, but it sure isn't natural. I'm thinking about hollowed out bones.. natural and more effective. We caught the syrup with gallon jugs with their lids on. Some days, they needed to be emptied twice, and our trees are only 16" or so. Next year, we may use 2 gallon buckets instead. We boiled the syrup down in stock pots on an old cast iron wood stove outside. Our first batch ended up with a hint of smokey flavor, so we got some stove pipe to get the smoke high and out of the pots. We would do better to have a large flat pan as it evaporates better with greater surface area. We found that it was better to boil down a smaller quantity at a time, because it was necessary to really keep it boiling, and the fuller the pot, the harder it was to do that. It is done when the bubbles start to get thick on top. Our 2nd batch was caramelly rich and delicious. We ended up with a gallon all together. It was a very bad season because it got too warm too quickly. My favorite part about the whole process was drinking the fresh sap. I drank about 2 qts. a day and could really feel the cleansing and healing from it. It also bonded me to the forest . We had some left over that I allowed to ferment in a glass jar just by leaving it at room temperature, covered. It was quite a tasty and refreshing drink.. sort of like lemony water. This has been a very joyous week for us as we watched Spring unfold. 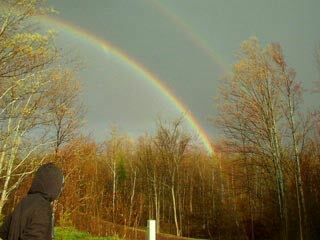 As a culmination of this beautiful week, we were treated us to a double rainbow right over our homestead this evening. We actually had the end of the rainbow right across the road. I've never seen that before. 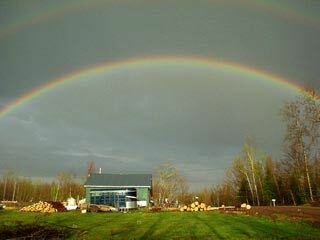 Yes, I'll agree, we've reached the end of the rainbow here! 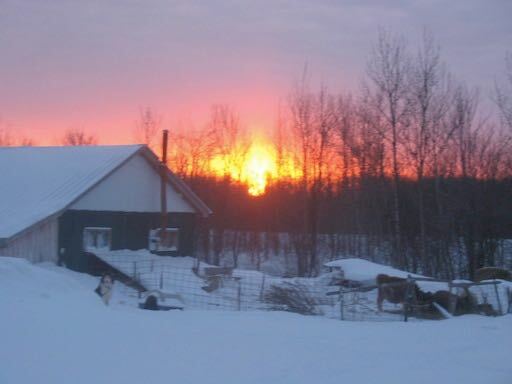 For those of you who haven't yet had the joy of homesteading, I don't know if words can describe it, but I'll try. It's dusk in the UP, just after 7 pm, and I just came in from tucking everyone in for the night. The chickens were just gathering together, clucking softly as I collected the clutch for the day. I carefully counted our feathered friends, yes, 16, snug for the night in their sweet smelling (thanks to EM's) roost, warm with the thick winter pack built up. I take their empty water bucket and go over to scoop some from the cow's water trough (an old bathtub we pulled out of the garage). 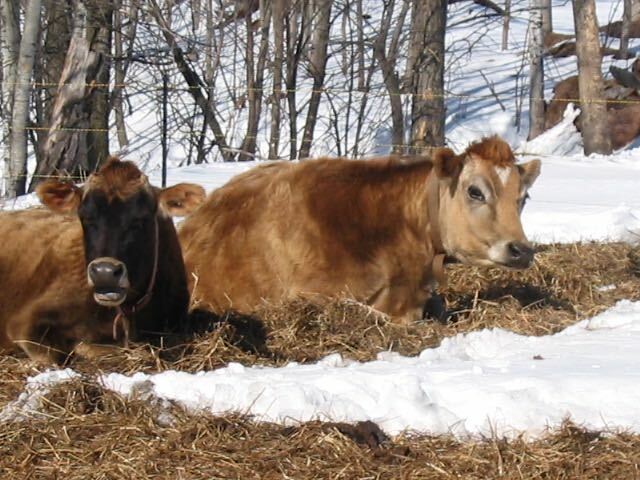 Daisy and Buttercup are contentedly chewing on hay and lazily give me a glance. Then I walk past the pen with our 4 milk goats and young jersey heifer and say my greetings to them. They are content and healthy looking. I notice that the horses are running low on hay and see that there's some leftovers on the ground in the other pen from where the guys had rolled the last bale to the cows, so I go tromping through the deep snow to fetch a few choice slabs of hay for them. They gratefully gather near the fence, and play their typical horsey games with each other.. tails swish, ears pin, let's play musical hay piles and see who's the boss of this herd anyway. They're beautiful. I reminisce about the nice time we had with them today, taking a few of them out for their first ever walks, and how much fun they seemed to have. After initially being a bit wary, Mary's mule gave her a look of disbelief when she later went to take some of the other horses out, leaving her behind. With that typical,"I'm going to get my way" mule attitude, she jumped the fence with ease to join the party. Well, ok, I guess you can come, too, if you're THAT set on it. I'm thinking ahead of how they will love the trail rides in the future, as they are all curious and enjoy getting out and checking out the world beyond their pen. They were brave today, a good sign. The kids had fun, too. It was as exciting for them as it was for their horses. Mary and Annie got to sit on Rapid, the horse we are boarding, while we walked, and got a taste for being up in the saddle again. It was a good day. I'm now walking back and peak in at the sheep, wondering how soon they will have their babies. The black one is laying closest to me and I can see a round bulge to the side of her that is unmistakably a baby, or two?? Johnny just came running out to greet me and I show him the sheep and explain where the new baby is and how cute that lamb will be when *she* (hopefully) is born. I start to head in, but Johnny insists on showing me a neat fort that the kids made where they shoveled out a drift around the wood for the house. Looks like fun, and I'm sure they'll have a great time playing in it tomorrow. I feel thoroughly and deeply satisfied, as if I just feasted at a lovely meal.